Leonardo describes the function of the drawing on folio 83v of Manuscript B (preserved in the Institut de France in Paris). It’s not actually a helicopter but an experiment with an aerial “screw”. 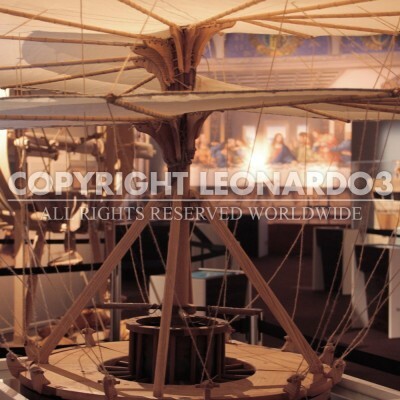 The experiment Leonardo proposes here is aimed at verifying that air is a fluid that can be pressed and “leaned on” in order to push oneself up in flight. If this were indeed the case, one could also make a “screw” spin, raising itself up by pushing the air down. 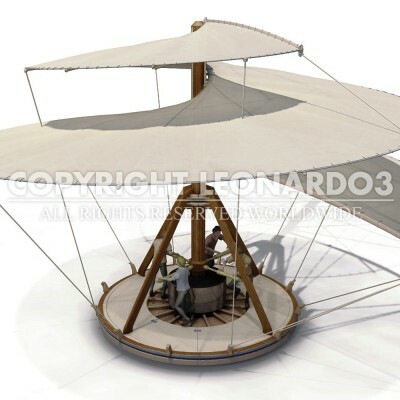 Leonardo was probably well aware of the maple seed that “goes into a spin” when it falls through the air because of its geometric shape. His idea of making a flying machine in the shape of a screw came from his careful observation of nature and his knowledge of mechanics and geometry. However, this machine only functions for a short time. After lifting off, the structure could not continue to spin because it would not have any support against which to press. “The external edge of the aerial screw is a thick wire with a maximum radius of about four meters (13 feet). To make this instrument correctly, you would need to use starched-linen cloth so the air does not pass through. If it is rotated quickly, this machine will spin as though it were a screw that penetrates the air and it will rise. To understand how this is possible, hold a drawing ruler in your hand and move it quickly sideways in the air, and you will feel how the ruler is pushed in the direction of the edge, going up or down”. The aerial screw is therefore propelled by a spring, which the operators must wind clockwise. Once it has reached maximum tension, the spring has enough energy to make the screw spin rapidly and forcefully in a counterclockwise direction. It is released from its base and takes flight for a few seconds.